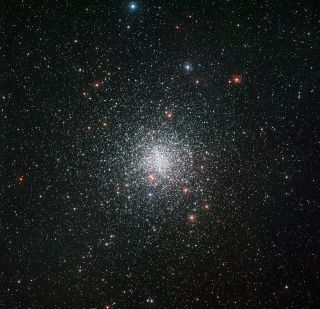 A new image from ESO’s La Silla Observatory in Chile shows the spectacular globular star cluster Messier 4, which includes a star that appears strangely youthful. One weird member of a nearby glob of stars in the Milky Way appears to posses the secret to eternal youth, scientists say. This glob, scientifically known as a globular cluster, is shown in a new picture from the European Southern Observatory (ESO)'s La Silla Observatory in Chile. The photo shows the glowing orb of tens of thousands of ancient stars, all thought to have formed in the universe's distant past. But one star shows surprising signs of youthfulness. Astronomers can gauge the age of stars by the chemical elements revealed in their light. Stars formed long ago, when the universe was young, generally contain few heavy elements, because the universe hadn't yet accumulated enough of these. And some light elements, which were present when ancient stars formed, are depleted as stars age. The weird star appears to have held on to its share of one such light element, lithium, according to recent observations. "The source of this lithium is mysterious," ESO scientists wrote in a statement. "Normally this element is gradually destroyed over the billions of years of a star's life, but this one star amongst thousands seems to have the secret of eternal youth. It has either somehow managed to retain its original lithium, or it has found a way to enrich itself with freshly made lithium." The star is a member of the Messier 4 globular cluster, one of the closest clusters to Earth. The cluster, also known as NGC 6121, lies in the constellation of Scorpius (The Scorpion), and is easily visible to stargazers through binoculars or a small telescope. The new photo was taken using the Wide Field Imager (WFI) on the MPG/ESO 2.2-metre telescope at La Silla.